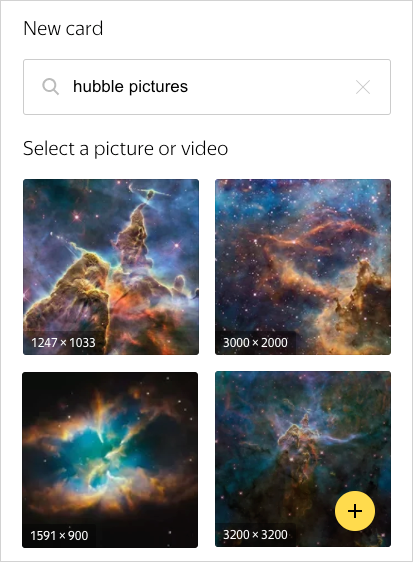 If you collect pictures from the Hubble Space Telescope or other interesting images, you can store them in their collections. Hover your mouse cursor over the card. Choose the collection you want to add the card to, or create a new collection. Click Add next to the collection you want to move the card to. Click Add card in the top menu. Copy and paste the link to the page with the image. 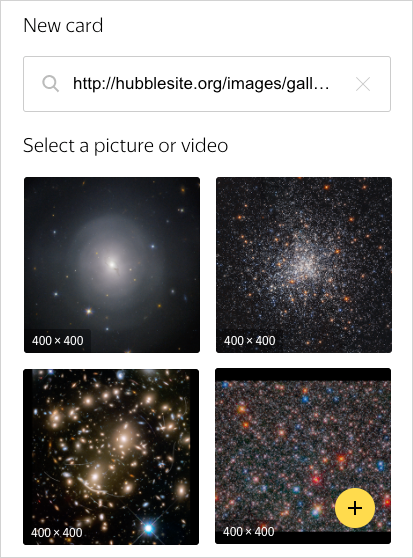 If several images are found on a page, choose the images that you want to add to a collection. Enter a description for the card. Choose which picture you want to add to a collection. Click the extension icon in your browser panel. Choose the images found on the page that you want to add to a collection. Click Add card → Upload from computer and choose the image from your computer or drag and drop the image from your folder to the Yandex.Collections browser page.